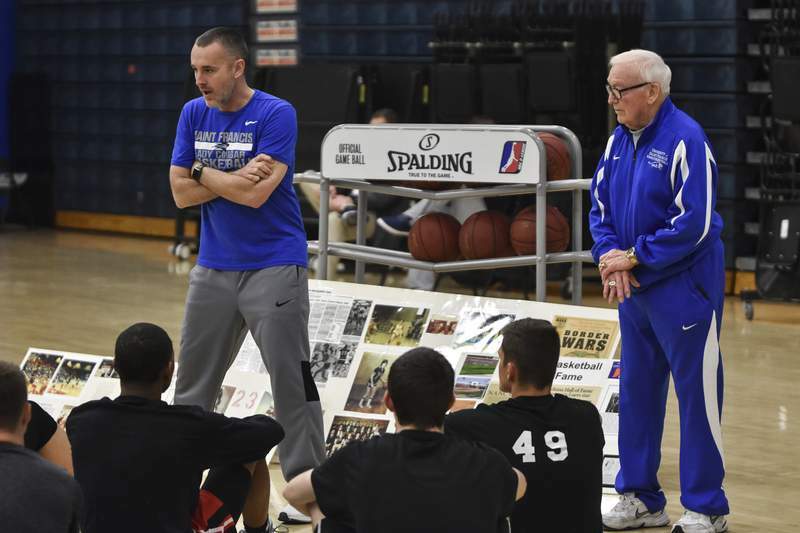 Mike Moore | The Journal Gazette Organizers Jason Ridge, left, and Tom Rehm speak with boys basketball players before Sunday's tryouts for the Nancy Rehm/Border Wars Classic team at Saint Francis. 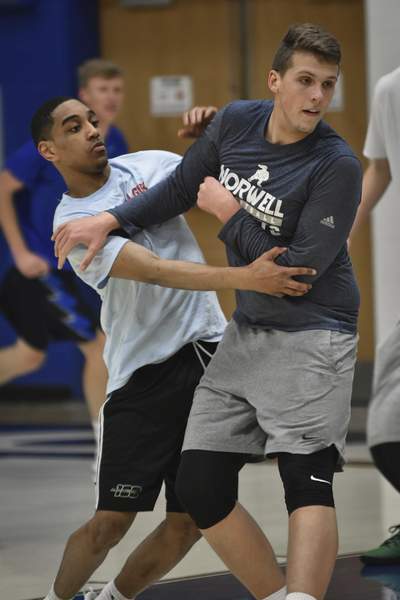 Mike Moore | The Journal Gazette Norwell’s Brandon Nicholson, right, and Wayne’s Kylon Jarreau fight for position during Sunday’s tryout. The top senior boys and girls basketball players in northeast Indiana know how to play against one another but the biggest key during tryouts for the 26th annual Nancy Rehm/Border Wars Classic is becoming a team. Tryouts were held Wednesday and Sunday as the Indiana rosters, who will compete against Ohio, will be announced today. The process involved scrimmaging with different matchups, creating a different and new challenge for players who are used to learning how to defend their new teammates. “During the season, all these guys, we're kind of enemies,” Homestead's Sam Buck said. “We don't despise each other, but we compete. We just go at each other. It's great to finally go out and play with these guys because they're great ball players. It's just good to compete with them. For Goodwell, seeing that aspect from the coaching side is fun, too. “I think that's always a great thing,” she said. “I've been a part of a couple of (All-Star games). I was an Indiana All-Star coach in 2013, and just having that ability to see the talents come together and really play as a strong, competitive team at all levels and being able to come off the bench with the same talent and opportunity, that's just a great thing to do. After Indiana swept last year's games, the Hoosier state comes in with a 15-10 advantage on the boys side and 13-12 for the girls. The games are April 29 at Saint Francis, with the girls at 2 p.m. and boys at 4:15 p.m.